Not only are bathtubs for seniors easier to get in and out of, but they provide a whirlpool feature for massaging body aches and pains. As we get older, our needs change. We may become less mobile and need some assistance with our daily chores. What used to be simple suddenly becomes much more difficult. When it comes to bathing, many seniors have trouble getting in and out of a traditional bathtub because of the slippery floors and curbs. Getting into a regular tub may be fairly easy when the area is still dry, but getting out can become a challenge. With nothing to grab on to and being set down on the floor, standing up and exiting can not only be difficult, but dangerous as well. Many seniors have fallen and injured themselves trying to get out of the bathtub. To help those that have difficulty getting around and may be handicapped, the installation of handicap tubs can provide a very good solution. Bathtubs for seniors, the disabled and others with mobility issues are becoming more and more popular. As our population ages, the need for less traditional bathtubs will increase. Bathtubs for seniors offer safer and easier access than traditional tubs. You enter through a door which closes and locks securely. The tub is much taller than a traditional tub so you can soak in it easily while sitting down on a shower seat. The Americans with Disabilities Act (ADA) has instituted certain standards for certification. 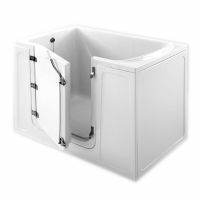 ADA approved bathtubs for seniors and others who need a more user friendly tub requires bathtubs to be a minimum of 60 inches long and 32 inches wide. In addition the floor and seat should have a non-slip surface and there should be shower grab bars to help as a supporting structure. Tubs come in a variety of sizes and styles. Many have a whirlpool feature that allows you to soak away the aches and pains of the day. A showerhead and other accessories are often part of the package. Professional installation is available and unlike a traditional tub, this tub can placed out in open space for easier access. If you are having difficulty getting in and out of your bathtub, you will love the easy opening door. Step into the tub. The door locks securely, water fills the tub and you sit on the built in seat and enjoy your bath. Once you are done, the water drains out and you simply open the door and step out. Handicap bathtubs are a simple concept that helps so many.